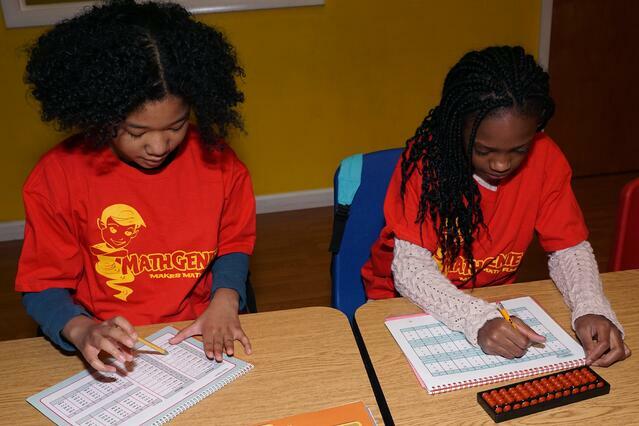 Math Genie is a revolutionary program that aims to liberate the genius in children. Our methods have been proven to increase concentration, develop razor-sharp focus and improve self-confidence. Math Genie students show a marked improvement in their grades and go on to develop enhanced creativity, imagination and visualization. By combining the ancient abacus and modern child-psychology research, we have created a program that helps students reach their fullest potential. To ensure that each child receives the maximum benefit, we employ the most passionate and experienced teachers. We also keep class sizes small. No more than five students are in classes for those 5 years old and younger. No more than eight are in our older classes. Our cutting-edge coursework ensures that students are interacting and having fun, rather than being bored by spending time doing worksheets. "I can't rave enough about how great this program is for kids all ages who have said they hated math at some point or other." Through the individual evaluation, the evaluator will learn quite a bit about a child's individual strengths and needs. The evaluator will then create an in-depth recommendation outline of what each and every child evaluated needs to ensure that they will succeed. This outline will provide recommendations for strategies that will enhance the child's learning experience, ultimately leading to their success in all areas. Based on each child's reading level, fluency, comprehension, overall ability, and age, the class coordinator will make recommendations for a class that would work best for the individual child. Assignment to classes also takes into account parent and child availability and preferred days/times.